Hidden Shoal Recordings today announced the release of ‘Mirror Girl (Scott Solter Remix)’, taken from the forthcoming album A Frame of Reference by Danish spectral noise-rock quartet Salli Lunn. 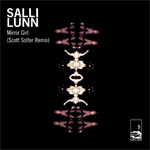 In-demand producer, musician and remixer extraordinaire Scott Solter, well known for working with bands as diverse as Superchunk, St Vincent, Neon Indian, Pattern is Movement and Boxharp, has worked his magic with Salli Lunn’s ‘Mirror Girl’. Solter’s remix pares back the original’s spidery postpunk guitars to bring a lurching industrial rhythm section to the fore. The interplay between the clattering drums, throbbing filtered bass and Lasse Skjold Bertelsen’s vocal creates a sweaty, nocturnal atmosphere that proves alluring and addictive. The track is accompanied by a superb video by Cam Merton, Hidden Shoal label manager and experimental film-maker, which renders the dark majesty of the track as a kaleidoscopic cascade of image fragments, like some sort of psychedelic tv nightmare. ‘Mirror Girl (Scott Solter Remix)’ is taken from the forthcoming album A Frame of Reference, which includes remixes of Heresy and Rite tracks by artists such as Markus Mehr, City Of Satellites and Manual, plus all new, previously unreleased material recorded with Jonas Munk (Manual) during the Heresy and Rite sessions. ‘Mirror Girl (Scott Solter Remix)’ is available for download now from the Hidden Shoal Store and its accompanying video is available for streaming on Youtube and Vimeo. A Frame of Reference is released on 8 September 2011. Album Heresy and Rite is available worldwide in CD and digital formats through Hidden Shoal Recordings. Read a full press release here. New Liminal Drifter Remix Album – Pre-Orders & Track Stream! Liminal Drifter’s “The Night Train Vacancies” Out Now! Liminal Drifter’s “The Night Train Vacancies” Scoops RTRFM Feature Album!